Dysport®, botulinum toxin type A, has been available in the U.K. since the early 1990`s and has licences in 67 countries worldwide including the United Kingdom and many European markets. It is manufactured by the French company Ipsen. The product is licensed for cosmetic use in a number of markets e.g. glabellar (frown) lines in Germany. It also gained approval for cosmetic use in the UK in early 2009 and is marketed for this indication, with a dosing specific to treat glabellar lines, under the brand name Azzalure® by Galderma. 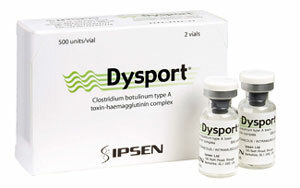 Dysport® is made from purified type - A neurotoxin produced by the bacteria Clostridium Botulinum. Dysport® is licenced in the UK for blepharospasm, hemifacial spasm, cervical dystonia, dynamic equinus foot deformity due to spasticity in ambulant paediatric cerebral palsy patients, two years of age or older; and focal spasticity, including the treatment of arm symptoms associated with focal spasticity, in conjunction with physiotherapy. It can be used off-label for cosmetic use. It also gained licensing for cosmetic use in the UK in early 2009 and is marketed for this indication, with a dosing (vial size) specific to treat glabellar lines, under the brand name Azzalure®. Dysport® is a registered trademark of Ipsen Ltd.
Click for ALL Dysport ® clinics in the UK & Ireland registered and verified by Consulting Room.